There must be a conspiracy to keep home owners in the dark on mirror and glass cleaning. Why is it so hard to clean mirrors and not leave streaks? The struggle is real. Anyone else agree? I have tried everything, paper towels don’t work, they leave streaks and lint. Next came newspaper, did that for years until they changed the ink on the paper and that method doesn’t work anymore. Even went to the squeegee, I found that works okay on glass doors if you use it right after a shower. Mirrors are a different story. I have had the hardest time coming up with a permanent solution to this dilemma. Well, I’m happy to report that I uncovered the big secret to a streak free mirror! Woohoo! Feels like I won the lottery! Check out this mirror I have hanging in our dining room. 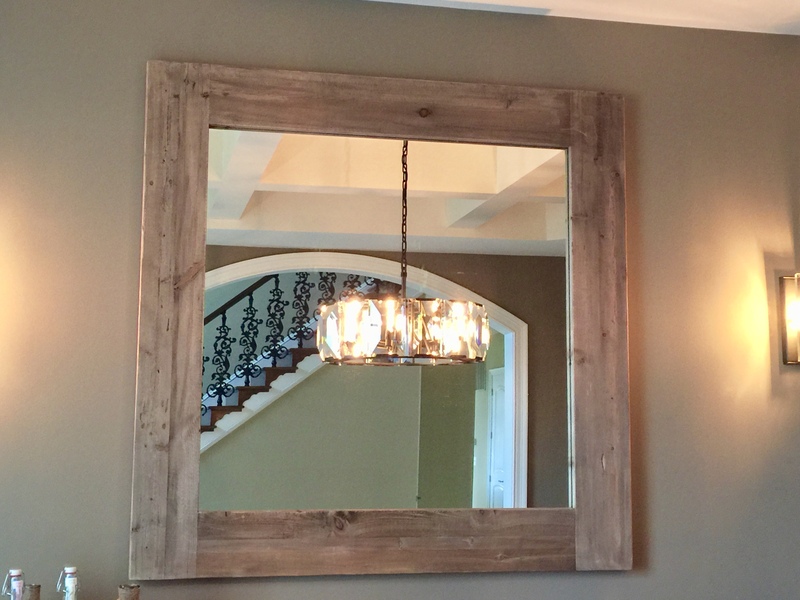 It’s a beautiful reclaimed wood mirror that I have never been able to get completely clean! Drives me nuts! It always has streaks on it…no matter how many times I clean it. Here’s a picture after I discovered the “big secret” to streak free cleaning! I couldn’t believe the results…no streaks at all! Now that I have uncovered the secret, I moved on to a much bigger project – cleaning the 6 ginormous floor to ceiling mirrors in our gym. First step is to look for any areas that have toothpaste, hairspray or anything goopy like your kids sticky fingers that made their way onto your mirrors. If you don’t remove it before you start, it could spread when you use the cleaner. Dab your cotton with the rubbing alcohol and remove the globs. Dry completely. Mix the vinegar and hot distilled water in an empty spray bottle (HERE). I love these spray bottles, they are so handy to keep around the house to mix solutions, or mist plants with water. We have even used them for misting the hair of my daughter’s American Girl Dolls. When mixing the solution for cleaning your mirrors, it best to use distilled water especially if you have hard water, which could leave calcium buildup and deposits. Use micro fiber clothes folded up in fourths. Using a micro fiber cloth is critical for a streak free shine, I used 7 clean clothes for my gym project. Check out these clothes in a bundle pack (HERE). Clean in a zig zag pattern, swiping from top to bottom of mirror. Here are a few before pictures showing the cloudy mirrors and streaks. These mirrors were so streaked and cloudy, I had to clean each panel at least twice. The first time removed the cloudiness and the second time cleaned and shined the mirror. It’s important to make sure you spray enough solution on the mirror, especially if the mirror is wide. For a narrow mirror, spraying down the middle would be sufficient, but these panels are extra wide, so I sprayed the left, middle and right sides. Then I followed the zig zag pattern down the mirror. The pictures below are the after pictures. It was hard to fully capture the change with all the reflections and use of flash in the room, but I think you can get an idea of how it turned out. It really was a remarkable difference, my husband was thrilled when he saw the changes in the room! The picture below shows the difference between the left clean panel and the right dirty panel. The picture below shows both mirror panels cleaned. I hope this post helps you get your clean on! You’re very welcome! Thank you for stopping by.